Verizon is in the midst of launching their new Flex View solution for viewing content like movies, TV shows, photos and videos. The free application essentially lets you access purchased, rented, or personal stuff anywhere – on your TV, smartphone, laptop, or fancy new tablet. Although it’s hard to say whether Flex View will give Netflix a run for its money given its a-la-cart nature and current lack of Apple support, Flex View certainly looks promising. You can find Flex View titles, of which Verizon says they have 1,400 listed, in a special folder in the “Featured” or “Browse All” categories under the VOD menu on your TV. Another way to get to Flex View titles is to download Media Manager from Verizon and click on the Flex View icon. Media Manager is offered for both Windows and Mac platforms and once launched will automatically search for shareable content on your PC. Available titles in the Flex View library include hits like Iron Man 2, The Karate Kid, and soon The Last Airbender (11/30/10). As of today only movies are available, but Verizon says TV shows will be added next year. And, as far as video resolution the movies are currently only offered in SD, although there is a browsing option for HD which indicates HD quality may be coming soon. Content from Flex View is downloaded, rather than streamed to your device, allowing you to watch the content without an internet connection. Renting a title will give you 30 days to hold it, but once started must be watched within 48 hours. Keep an eye on your hard-drive space though, those large movie files can fill up a smartphone pretty quickly. Rental fees are generally $2.99, although not all titles are currently available to rent. You can also purchase an SD quality title for $9.99, but again like renting not all titles are currently available for purchase. Some movies are priced higher than $9.99 like Agora (2010) at $16.99, or the 1938 film The Adventures of Robin Hood for $11.99. Photos, videos and music from your personal library will also be accessible next year with Flex View. You’ll be able to get to your personal content from multiple devices once uploaded via Media Manager. 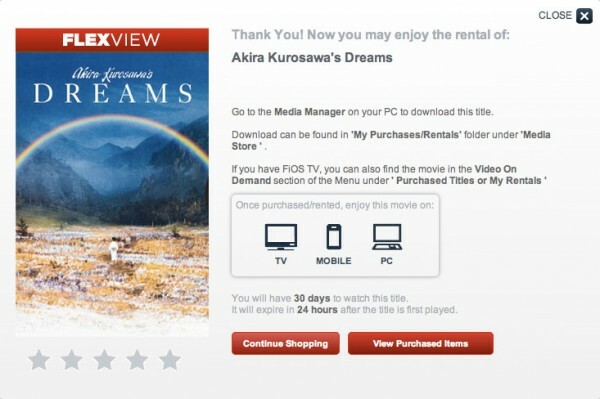 The accessibility of personal content as well as purchased/rented content through Flex View is certainly an advantage over Netflix’s movie/TV-only content – although use is slightly more cumbersome given the fact that Media Manager must be used as an in-between-app. To download Flex View for your mobile device go to https://m.verizon.com/apps/ and look for the FiOS On Demand tab. Devices currently supported include Blackberry Storm2, HTC HD2, HTC Imagio, HTC Touch Pro2, LG VS750, DROID 2 by Motorola, DROID X by Motorola, Samsung Omnia II, Archos 605 Wi-Fi Portable Media Player and Toshiba Satellite T230.